This charming and quaint 2 bedroom/1 bath cabin is a true mountain getaway complete with log interior and rustic furnishings. Located on Sun Valley Lake where you can enjoy catch and release fishing and non-motorized water sports. The wood burning fireplace in the living room and log stairs leading to the 2 bedrooms add to the Colorado cabin experience. The back deck is a perfect setting for a relaxing afternoon. Free WiFi and cable included! This home also has a sleeper sofa bringing the accommodation for this home to 6 people. NOTE: No power craft (electric or gas) of any kind is allowed on Sun Valley Lake. The lake is a catch and release sport fishing lake only. OPEN LOG STAIRS TO BOTH BEDROOMS. PLEASE NOTE THAT THERE IS A FIVE NIGHT MINIMUM STAY OVER THE 4TH OF JULY HOLIDAY. Minimum Age Requirement to rent this home is 21. STAY 4 NIGHTS AND WE'LL WAIVE THE CLEANING FEE! Coyote Cabin was a perfect rural retreat and Grand Mountain Rentals was wonderful! Delightful people, very helpful, accommodating, and kind! Coyote Cabin is pretty unique! So glad you enjoyed your stay. We had an incredible time at the Coyote Cabin. Peaceful, beautiful and saw amazing wildlife. Will definitely return! Coyote Cabin is truly a special place. So glad the wildlife cooperated! A terrific cabin...beats camping in a tent by a long shot. Very close to Winding River RV Resort if you're looking for a cabin nearby instead of camping with a group at the RV resort. That's what we did. Less than a half-mile to the RV resort and walkable if you want. Everything in the cabin is as it says it is...rustic but comfortable. Perfect spot on the lake. It wasn't as quiet as we anticipated because sound carries greatly across the lake and its shoreline all the way around is dotted with vacation homes, which during our stay included big families partying on their decks or on the shore. We'd rent it again despite the stairs from the bedrooms to the main level. Those are tricky. Glad you had a good time. We look forward to your next visit. The lake was very pretty and relaxing. The views amazing! Though loud neighbors across the lake and beside us that really ruined some of the nice evenings for us, also lots of people speeding past the house making for some noise. Highly recommend investing in a water softener, the water tasted AWFUL and with filling up camelbacks for hikes and bike rides, it made for some grosse water... Didn't really like that we had to bring our trash into town... we paid a cleanup fee... this should be included in said cleanup fee! Also, I would suggest as well... getting some kayaks, it would have been nice to get out ON the lake... Other then those items, the house was super cute and the property very beautiful. Thank you for the review and we are happy you enjoyed your time at Coyote Cabin and Grand Lake. July is our busiest month here in Grand Lake with lots of families having fun! The trash dumpster is provided free of charge to our guests as trash cannot be left outside the homes due to some of our furry creatures that roam here. There was no cleanup fee added to your stay since you stayed 5 nights - we always waive the cleaning fee of stays of four nights or more. We hope you get a chance to come back to Grand Lake again! A family vacation. Our first trip to the Rockies as a family. Vacation filled with outdoor activity. So cool. Glad you had a great vacation. My son, daughter and I stayed at Coyote Cabin. The property has a hand crafted cabin feel and backs to a small lake. My kids really liked the property and enjoyed our short stay. Great value, highly recommended. I left a bag at the property the management company went out of their way help us out- Thanks Again! Great Weekend - Beautiful Location! This is a beautiful cabin in a fantastic location. Cabin was really clean and decorated nice. Would love to stay again. Lake views from two balconies! What an amazing place enjoyed by our whole family; age 5 to 65. So close to everything (National Park, hiking, horseback riding fishing, Grand Lake, the lodge). I will be returning. I recommend renting this cabin! Overall we really liked the cabin. It's clean and cozy, great Lake. A few things though, would like to be able to use a canoe like most of the other rentals on the lake. The water smelled like rust and the shower water was tinted red, actually stained the towels when drying off. On Saturday it sounded like a military excercise was going on across the street with all the gunfire. It was a beautiful location. The cabin was comfortable. If there was a drawback, it was that the bathroom was on the lower level while the bedrooms were on the top level. The stairs made it potentially hazardous to go to the bathroom at night. Having said that, the lake is great and the cabin in the wooded area is a wonderful setting. It was cool during the day and pleasant sleeping at night, very quiet. Good access to the national park and Grand Lake town. We saw moose and elk, birds and other wildlife close by. I enjoyed the stay there. We have been to Colorado twice loved every second of it stayed in the same cabin both times wonderful exciting experience. I was going to say that I didn't want to recommend it to anybody else because. I want to keep it for myself when I want to be there in the same condition that it is now. But I think everybody should be able to experience that place it's wonderful. It was a wonderful cabin, enjoyed thoroughly the deck overlooking the lake, it was very serene and peaceful each day. The only item of concern was the water, not drinkable, as it was rusty from the pipes. Even after the filter was changed it was still rusty and smelly. Myself and my three sons stayed at the Coyote Cabin for four days in August to attend a wedding at Grand Lake Lodge. The cabin was isolated, but had all the amenities, which was what I wanted. My sons were a bit disappointed that the water around the dock behind cabin was too overgrown with seaweed for fishing, but otherwise the cabin was perfect. I particularly want to shout out the people at the Grand Mountain Rentals office in Grand Lake, who were super-friendly, helpful and patient with all of my questions as a first-timer in the area. They helped make my family vacation all that more enjoyable. We are so pleased you had such a nice time at Coyote Cabin with your sons. It is a very special cabin. Thanks for the "shout out" to us here at the office. We really enjoy helping our guests get the most from their vacation here in Grand Lake! Hope you will come back and visit again! Had a great time ! Used this rental for over flow from our other cabin we rented. Love the area. Had great family reunion. The Coyote cabin was very clean and cozy . We slept 5 there for 5 nights and we were very comfortable . Great location by the lake ( I do wish there was a paddle boat on site instead of having to rent one from town though ) . Overall great place . So happy you enjoyed Coyote Cabin. It is a charming place! Please come back and stay with us again! House on the lake was perfect setting. The house was very clean with the exception of mice. A couple of traps seem to eliminate that problem. Only suggestion I have is to enlarge the dock. We like to fish but found it hard to fit more then one person at a time on the dock. We did get to experiance a Moose cow and her baby. That was very exciting, our first live Moose encounter. I highly recommend the cabin and the area it was in, especially to a young family, Watch out though, both bedrooms are up stairs with some pretty steep stairs to navigate. Great, quiet location. Close to town and RMNP. Beds a bit small. No dishwasher. Spent 4 nights in the coyote cabin. Nice location with wildlife. 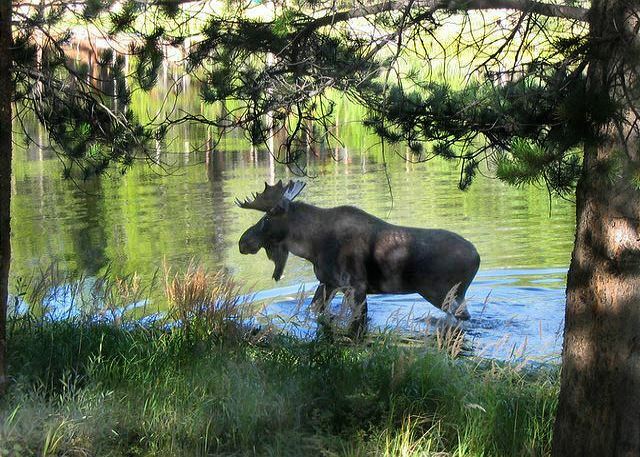 We had 2 otters on the property as well as a young moose several times.